Let’s consider the religious figure of the Madonna (I mean Madonna as in Jesus’s mom, not the singer). Her face is classic, isn’t it — especially when represented in front of Nature? She becomes a landscape and a landscape-in-a-landscape: a mirror of the world at large. While the Madonna kept herself clear of the action by giving birth to the Child, contemporary women, and especially artists, are now taking over the means of self-representation, portraying their own situations (instead of waiting for the odd Raphael to do it for them). They are consciously portraying themselves in the context of their Now. Photography has been a successful medium for this endeavor, and through it Cindy Sherman became the many women she probably is; more recently Petra Cortright has gone a step beyond Sherman with her YouTube self-portrait films. 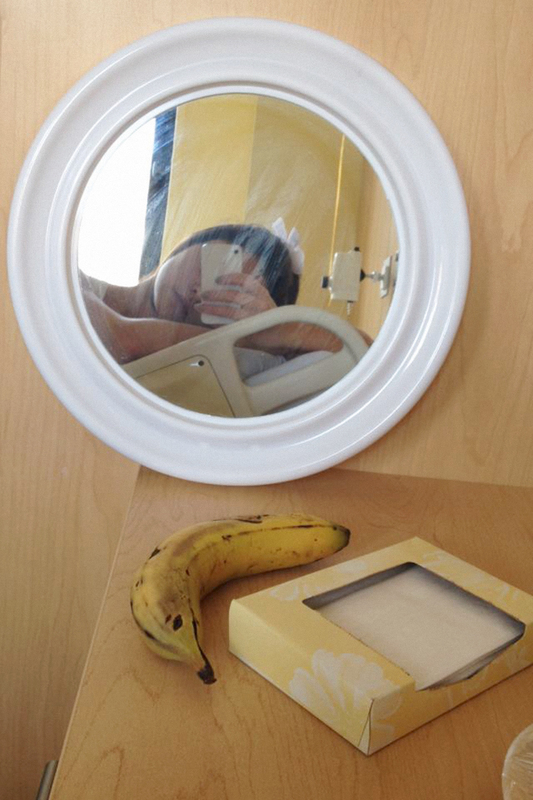 And these days, Amalia Ulman is taking over the Internet with her selfie photos and daily visual-confessions on Facebook. This September, destiny tried hard to stop Amalia from working. The Greyhound bus that was carrying her from New York to Chicago crashed, leaving Amalia in a hospital bed with both of her beautiful born-in-Argentina legs seriously damaged. But Amalia can’t be stopped: she actually accelerated her output despite the pain. She kept on producing iPhone self-portraits, which is her rawest and most direct form of artistic production (aside from the aforementioned iOS Photo Album Diary on Facebook). Without a studio or access to tools, her practice focused on what was left to her: an Internet connection mixed with some cognitive labor. These selfies, along with the other pictures that we are publishing in this issue, represent Amalia’s voice from that particular moment. I recognize in them the latest resurfacing of the Madonna, the most tender human landscape there is online.